PITTSBURGH—Radio-frequency technology developed at the University of Pittsburgh that uses human tissue instead of air as a conduit for radio waves is the basis of the first electronic “tag” system designed to track and monitor orthopaedic implants. 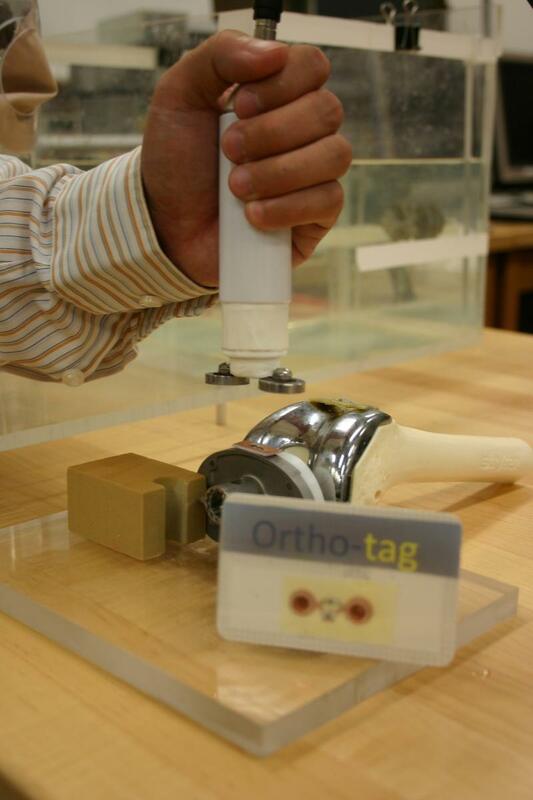 The noninvasive system, known as Ortho-Tag, features a wireless chip attached to the implant and a handheld receiver that together would let physicians view the critical information about artificial knees, hips, and other internal prosthetics—as well as the condition of the surrounding tissue—that currently can be difficult to track down. The chip, or tag, would have information about the patient, the implant, and the procedure uploaded to it prior to an operation, explained New Jersey-based orthopaedic surgeon Lee Berger, CEO of Ortho-Tag, Inc., and inventor of the tagged implant. In addition, sensors within the chip would gauge the pressure on theimplant, the chemical balance and temperature of the tissue, and the presence of harmful organisms. 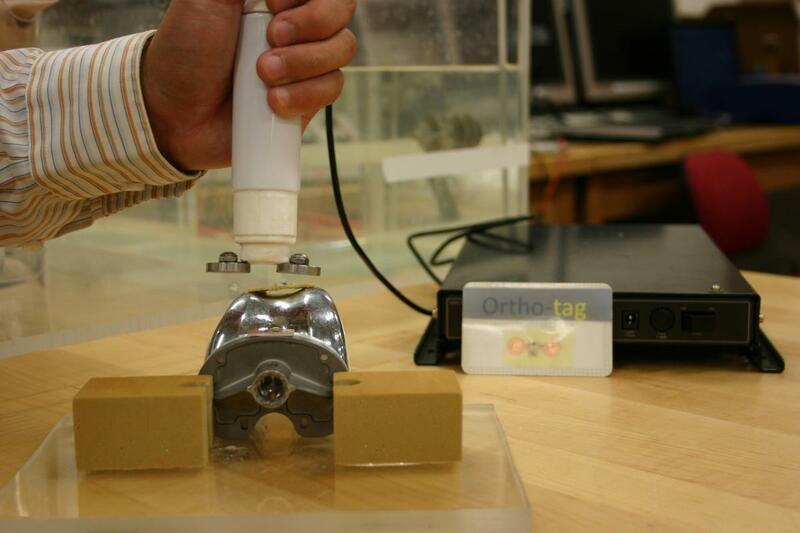 Ortho-Tag would be affixed to an orthopaedic implant and scanned via radio-frequency with a probe and RFID tag developed at Pitt. A card (foreground) would be available to patients with an existing implant. All of this information would subsequently be read by a handheld probe developed in the laboratory of Marlin Mickle, the Nickolas A. DeCecco professor of electrical and computer engineering in Pitt’s Swanson School of Engineering. When placed against the patient’s skin, the probe communicates with a radio-frequency identification (RFID) tag devised in the Mickle lab by Pitt graduate researcher Xiaoyu Liu that emits a unique wavelength designed to travel through human tissue. Special software would display information from the tag on a computer. Berger recently patented the Ortho-Tag system (U.S. patent 7,932,825), and Ortho-Tag, Inc., has optioned the rights to Mickle’s work. Berger envisions Ortho-Tag being attached to implants by the manufacturer, and he is currently building partnerships with manufacturers. Ortho-Tag, Inc., would distribute the software and probe to physicians. For people with existing orthopaedic devices, the company is considering producing wallet-sized cards with an affixed RFID tag uploaded with information about the patient and the implant, Mickle said. Berger developed the Ortho-Tag concept to resolve a frequent shortage of information he experienced with patients who had received orthopaedic implants. In many cases, patients knew little about the type of device they had received, the company that manufactured it, or even the surgeon who had performed the procedure. Those details could only be learned through an extensive paper trail, made even more complex when dealing with out-of-state patients. “Other than written records, the only way to learn about a device once it’s implanted is through an X-ray. But even that does not provide such details as size, model number, or manufacturer, or health information about the patient that is directly related to the implant’s performance,” Berger said. Information from Ortho-Tag is displayed on a computer by way of specially designed software. In addition, said Mickle, defective implants are typically recalled by serial number, crucial information that is typically kept on written records where the original surgery took place. Ortho-Tag could be used to identify a suspect implant quickly and easily. Ortho-Tag represents the growing potential and role of RFID technology in health care, Berger and Mickle said. A 2009 RAND Corporation (Europe) technical report found that RFID technology offers several advantages to medical care in such areas as wireless data transfer and patient/object identification and as a sensor—the primary functions of Ortho-Tag. “There are a lot of different devices manufactured by a lot of different companies and implanted at a lot of different hospitals by a lot of different surgeons,” Mickle said.